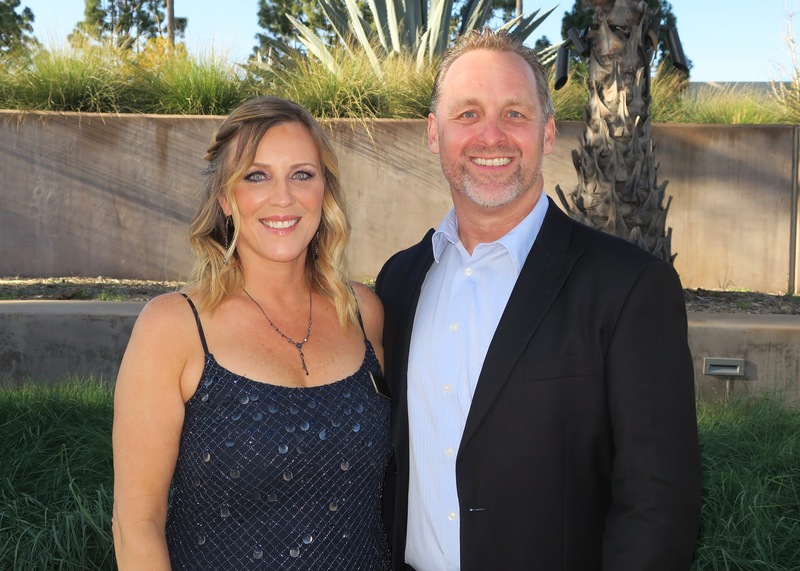 On March 16, about 250 enthusiastic supporters of Santa Barbara Channelkeeper gathered in the magnificent Rotunda at Deckers Brands Headquarters for its 19th annual Blue Water Ball fundraiser, which netted nearly $200,000. This small but mighty nonprofit protects the Santa Barbara Channel and its watersheds through science-based advocacy, education, field work, and enforcement. Guests, many festively clad in blue in a nod to the evening’s theme, mingled during the reception in the light-filled Rotunda while enjoying music by the Santa Barbara Ukulele Club. At dinner, emcee Andrew Firestone welcomed guests and proclaimed how vitally important Channelkeeper is. As a father of three children, he related that he understands the importance of preserving our channel and waterways, which face new challenges all the time, and how we need Channelkeeper to continue to stand vigilant every day. Redmond explained how Channelkeeper has been addressing the impacts of the Thomas Fire and 1/9 Debris Flow on our creeks and beaches. It is doing monthly water-quality sampling in Montecito’s creeks, and when the county began dumping mud from debris basins onto Carpinteria and Goleta beaches again last month, Channelkeeper sampled water quality at those and neighboring beaches and made results available to the public (as it did with the beach dumping last year). With researchers at UCSB, Channelkeeper is also documenting the longer-term impacts of mud disposal on water quality and beach and offshore habitats. Redmond shared highlights of the past year’s victories, some of which Channelkeeper achieved by working with partner organizations. The City of Santa Barbara banned Styrofoam containers and plastic straws, and just last week, the City of Carpinteria enacted one of the most progressive single-use plastic bans in the country. As for agricultural pollution, the California 3rd District Court of Appeals ruled that existing, weak regulations are unlawful, which has resulted in the Central Coast Regional Water Quality Control Board issuing new, much more effective proposed regulations, including on how much fertilizer can be applied to crops. Regarding fracking in our channel, as a result of a lawsuit challenging the issuance of permits without proper impact assessments on the environment and endangered species, a federal district court issued an injunction prohibiting the approval of new permits until impact assessments are done and considered. Older enforcement efforts came to fruition, including a 2012 settlement with the City of Santa Barbara to upgrade its sewer infrastructure and better manage its system to reduce spills. Last year saw only six spills, compared to 44 10 years ago. In response to a 2015 Channelkeeper lawsuit against the county, the county committed to redesign its South Coast Recycling and Transfer Station to capture and divert runoff to Goleta’s sewage plant for treatment. At the time, the station had the highest number of violations of any industrial facility on the Central Coast, but now has eliminated its discharge of pollutants to storm drains, Atascadero Creek, and the ocean. The audience was wowed by these and other accomplishments and also by a surprise appearance by Patagonia founder Yvon Chouinard. Explaining how he gets requests to give speeches all of the world, Chouinard related that at his advanced age, he has his friend and colleague Rick Ridgeway do his “dirty work,” which he later referenced as passing along the gospel. After Chouinard entertained the crowd with his sharp wit, he introduced Ridgeway, Patagonia’s VP of public engagement, who is also a highly accomplished mountaineer, setting records that include being the first American (with two buddies) to summit K2. Ridgeway explained through colorful stories the problem of too many people using too much of our planet’s limited resources, and how the biggest problem is the growing affluence of the growing population. He lauded Redmond and her team for their invaluable work. Ridgeway recognized Patagonia’s business model of being a force for good — a model that shows it’s not just about shareholders, but about all life on our planet, and shared some of Patagonia’s initiatives. The company donates one percent of gross revenue, more than $10 million last year, to more than 1,000 environmental groups, including Channelkeeper ($35,000 last year). After Firestone completed the ask, DJ Darla Bea spun the tunes, and the dance floor filled. Originally founded as a program of the Environmental Defense Center, Channelkeeper became independent in 2001. It has a small staff of six, hundreds of volunteers, and receives only a tiny amount of government funding (3 percent of its budget). For more info, go to www.sbck.org.